A sparsely populated and remote part of the county is now an organic food mecca. Tending crops at Marin Roots Farm. THE NONPROFIT ORGANIZATION Marin Organic recently announced that its mission has been accomplished, and it closed its doors. For the last 15 years, the group has worked to promote, support and publicize Marin’s small farmers, and now, with Bay Area residents more food-source literate than ever, it seems there isn’t much more to do. But the seeds of the group’s accomplishments were sown even earlier, through vibrant yet unsung grassroots organizing. Today, western Marin is renowned regionally and beyond as a mecca for sustainable agriculture. By 2014, the county boasted 66 organically certified producers tending nearly 300 acres of row crops and more than 40,000 acres of pasture. Their wares — including vegetables, greens, fruit, cheese and meats — were worth nearly $46 million. Menus around the bay tout ingredients of local provenance, and many diners know the farms and ranches by name. “We have integrated all these different elements in the community, from the consumer to the chefs to the growers to the ranchers to the county,” says Warren Weber, owner of Star Route Farms in Bolinas — the oldest certified organic farm in California — who in 1973 helped craft the state’s first certification standards. But the food landscape wasn’t always like this. Just a few short decades ago, most residents of Marin had little awareness of — or pride in — the sparsely populated agricultural half of their county. In 1990, the term “locavore” had yet to be coined. The county had only four certified organic farms totaling just 67 acres. And while interest in organic food was growing, it was far from the booming industry that it is today. Smaller growers were being squeezed out as larger growers and distributors moved into the existing market, driving down prices. Most critically, consumers had yet to differentiate between local or industrial-scale organic products. It was in this climate, during the mid-1990s, that a small, dedicated group of farmers and their allies began to meet, discussing how to support one another and the work they loved. Their efforts ultimately led to the formation of Marin Organic — as well as the founding of the Point Reyes Farmers Market and creation of the state’s first county-run organic certification program. Though there were initially several similar groups, including the West Marin Food and Agriculture Project, the effort coalesced into the West Marin Growers Group, says Ellie Rilla, former director of University of California Cooperative Extension in Marin (UCCE Marin). They met in iconic West Marin locations such as Manka’s Inverness Lodge, Toby’s Feed Barn and the then newly opened Tomales Bay Foods. The loose-knit coalition included local farmers, retailers, county representatives and restaurateurs who all wanted to promote small-scale, artisanal, environmentally sound food, while preserving the energy and spirit of social justice that the movement had originally come to represent in the 1970s. Different members had different (though often overlapping) passions. For example, Martinelli was concerned about preserving or expanding organic standards in the face of increasing industrialization, while Janet Brown, co-owner of Allstar Organics, championed the idea of food security and that a region should know how to feed itself. In 1995 the group launched the Point Reyes Farmers Market, providing a place for local growers — many of whom were little more than backyard gardeners — to hawk their wares directly to the public. The market had to overcome skepticism and local backlash, though, Conley says. “We asked the farm bureau and the Marin Agricultural Land Trust to sponsor it, and they both said, ‘We don’t have farmers in Marin; we only have ranchers,’ ” she recalls. Local stores, restaurants and a small farmers’ market based in Woodacre also objected, fearing competition. “They found it threatening — it was a big change,” says Chris Giacomini, owner of Toby’s Feed Barn in Point Reyes Station. In the following years, the Growers Group collaborated with the Marin Agricultural Land Trust (MALT) to launch the first Taste of Marin food gala (then called the All-Marin dinner), which featured gourmet meals composed solely of foods produced in Marin. This showcase for the usually behind-the-scenes farmers was to be a seminal culinary event for the next decade. As momentum continued to grow, the county sponsored workshops on agriculture, bringing together disparate groups that at the time rarely collaborated: conventional and organic growers, farmers, ranchers, even master gardeners. “A lot of it was about trying to look at things in different ways and going back to the way your grandparents used to do things — like making cheese,” says Rilla, who put on a 1996 workshop on agricultural diversification and also worked to help the Growers Group organize and define its goals. In 2000, two pivotal events happened. First, the county agreed to conduct organic certifications — making the process more affordable and thus more realistic for local farmers and ranchers. Second, the Growers Group redefined itself as Marin Organic and incorporated as a nonprofit. A new era had begun. The young Marin Organic fledged quietly for its first few years, led by part-time coordinators. Weber — who had not been part of the Growers Group — brought his considerable contacts and reputation when he signed on as the first board president. The nonprofit’s first major accomplishment was the development of a labeling program to help the consumers make the connection to where food is grown, which launched in 2002. The now-familiar green and white logo appeared on banners, grocery store twist ties, farm and produce signs, and on the walls of restaurants that committed to buying a certain amount of produce from Marin Organic growers. In 2004, the nonprofit hired Helge Hellberg as the first official executive director. When he came on board, he says, there was no office — nor even a website. He says building something from the ground up was a thrill. Hellberg soon expanded Marin Organic’s profile, programs and staff. Born in Germany, Hellberg had spent the ’90s touring Europe with the popular a cappella band Five Live, and he brought a performer’s flair and joie de vivre to his new position. Recently he compared his first months in Marin to his band days. Prince Charles in West Marin with Helge Hellberg. In addition to promoting and assisting growers, Marin Organic projects grew to include young farmer education, gleaning and a cutting-edge lunch program bringing organic food to local schools. The organization led tours, hosted events and provided a directory of farms in Marin. And, of course, it famously brought Prince Charles to West Marin. Farmer members received publicity, support and a group identity that was marketed vigorously. 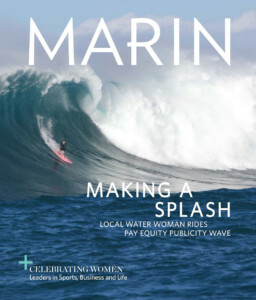 In recent years, however, the energy behind Marin Organic began to wane. Bay Area consumers required less education, while farmers also needed less support. Hellberg resigned in 2011, and the staff gradually shrank. Once again they didn’t need an office, so they moved out in August 2015. When current executive director Jeffrey Westman announced his resignation last fall, it spurred a conversation with the board about what to do next. Perhaps most critically, funding for such a narrowly defined organization shrank as the obstacles to overcome grew fewer — public opinion had caught up with the organization. “The organization served a huge purpose, but at a certain point it’s kind of like beating a dead horse,” Westman says. After the board chose to officially shut down, existing programs were passed on to other nonprofits. For now, though, the group has retained control of the label and the 501(c)(3), and they are discussing what, if anything, to do next. “I’m hoping it can re-emerge in a different way that serves the issues of today,” says Conley.